The monster elephant in the room – overpopulation – is apparently a taboo topic. Anyone paying attention to this mega-problem, though, saw it coming in the Population Bomb by Paul Ehrlich (1968!). Global starvation and social upheaval are the result. Ehrlich saw it coming and predicted the consequences. He was mostly right. If anything, he was overly optimistic. People are our greatest resource. We just have too much of a good thing. 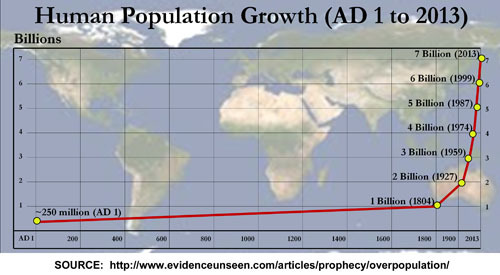 The population carrying capacity of our planet, estimated by ecologists in the 1970s, was thought to be 12 billion. That seems to have been an overestimate. We are ‘only’ at 7.2 billion now, and showing signs of maxing out already. If we are accelerating into a Malthusian Catastrophe, which seems to be the case, self-correction by Mother Nature will be the final word. It’s already happening in so-called ‘developing’ countries. They have no chance of ever developing. Can you even imagine having this as a topic at a presidential debate? Nope? Me, neither. The main emotional issues of the day rule public discussion. You know what they are. Rampant yellow journalism blasts them at you every day of the year. Some of these issues showed up, interestingly enough, in a recent movie – The Big Short (2015), based on a book by Michael Lewis (The Big Short: Inside the Doomsday Machine, 2010). You can only get a meager peak into financial shenanigans by reading Lewis’ book. For my money, a much more cogent explanation about everything leading up to the 2008 recession comes from James Howard Kunstler in The Long Emergency (2005). Lewis provided a retrospective on it (20-20 hindsight), whereas Kunstler predicted it. Then get an old copy of The Population Bomb. You might also want a stiff drink. You will otherwise be hard-pressed to sleep well once you find out what really goes on behind the scenes and where we are headed as a species. And if you are waiting for your public servants to talk about any of this, much less come up with solutions – well, don’t hold your breath. Writing these musings felt curiously like a rant. Don’t worry about me, though. Pretty soon I will go lie down for a little while. I always feel better after doing that.